I was very, very confused. Knowing that I signed up for something last June, I tried to dig around more. The courses linked on my account simply led me to this page. Hm, perhaps Coursera is now only offers paid classes, after the few years that they were free and merely testing out the earlier classes. We are fully committed to our mission of providing universal access to the world’s best education. As such, we continue to offer free and open access to all courses. We also offer learners the option to earn Verified Certificates, which provide official recognition from Coursera and the partner institution offering the course and formally showcases their achievements. Our robust financial aid program offers full support to learners who can demonstrate that the registration fee for a Verified Certificate is beyond their financial means. However, the reply was posted in June 2 of this year. Clearly the course that I signed up for back then is now completely paid, therefore the “free and open access to all courses” no longer applies. 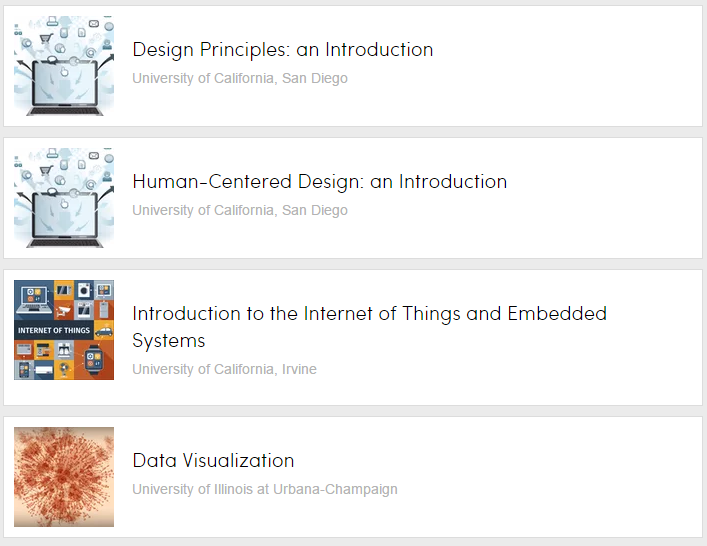 Since the reply from a few months ago confirmed that there are at least some courses that are still free, I decided to find any design-related classes that I could still sign up for to replace the now-paid course. I realized that some of the courses under the Specialization I viewed earlier could in fact, be taken for free (without a certificate). Three of the classes were not available for free, but the others I had to sign up to access the free course again, using the specific links that were revealed under the “See All” button. There was absolutely no indication from the Specialization page that some of the classes could be taken without paying for it. For some of the courses, you may have free access to the learning materials and only need to pay if you want a certificate. 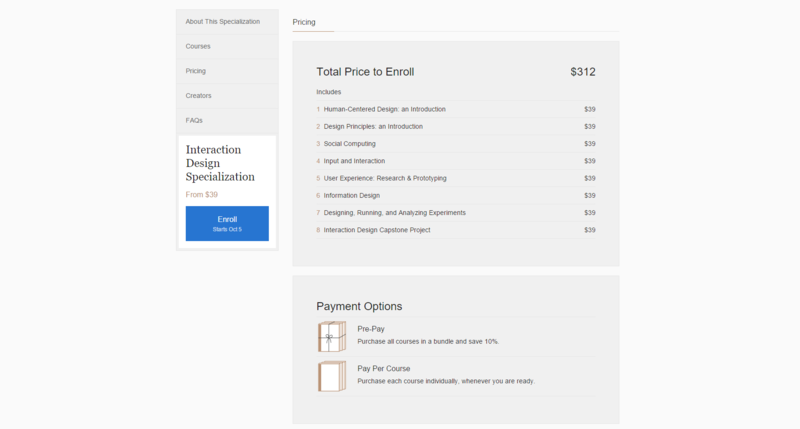 I could no longer find the course “From Point of View to Prototype” from the catalog, nor was it included in the Interaction Design specialization. 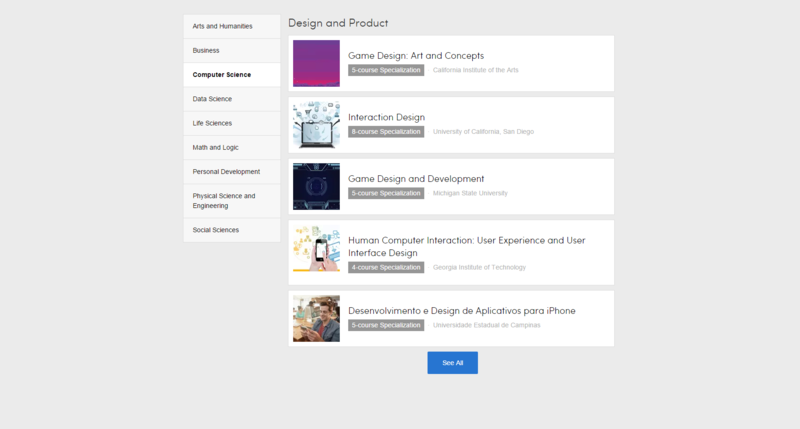 Instead, there was a new course titled, “User Experience: Research & Prototyping” (which seems to be of the same topic, and they may have renamed the course). From the email sent to me back in June, there was no indication that the course itself would end up behind a paywall, explaining only the payment system for a Verified Certificate. The change was something I didn’t expect. I can only assume something must have changed between June and September. I don’t mind that some courses need to be paid for now. What bothered me most was that some content can be accessed without paying for anything, but it wasn’t made clear. 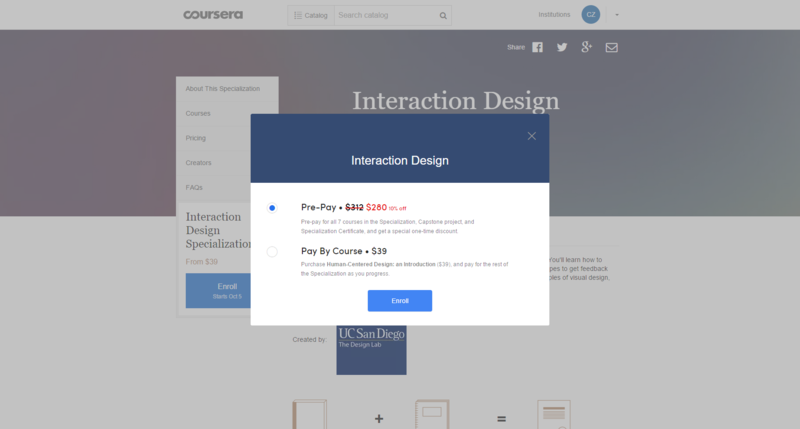 Coursera wants you to pay. For this reason, all the default choices and actions are those that requires a fee. Anything that could be accessed for free are harder to find. If I wasn’t so keen to find the classes by Category, I would not have known that some of the course materials could still be viewed without paying first. By making options hard to find or understand, they purposely make it seem that you have to pay for all the classes. As a customer, this change has been very misleading. I wanted to take the classes to review what I know or have learned, since I’ve been attending some workshops and talks for the past year. It’s also important to brush up on concepts so I could communicate with my teammates better. I’ll be taking the available classes so far, but this experience has also affected the way I view Coursera. I understand that to an extent education may have to be paid for, and their design decision seems to be favoring their business objectives (and as a business, they would have to make money). However, as a consumer, hiding away some of the options and making them hard to find I felt was misleading, and once I realized this I lost my trust in the company. Other sites that offer classes shows the free/paid options upfront. If I choose to pay for a course, it’s not because I was misled into thinking that it was the only option. Some of the courses are starting soon so I can verify the exact difference from the paid and free version of the class (aside from certificates). The way I understand the system may still be wrong, but overall this was a very confusing change.